In the tundra of the Far North, the wind blows steadily and sometimes fiercely. 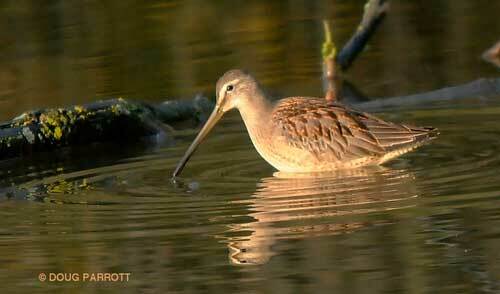 It ruffles the feathers of one Long-billed Dowitcher as he faces south, into the teeth of the wind. His mate stands nearby, her feet in one of the innumerable puddles that nourish the insect larvae hatching all across Alaska. It is the larvae that have brought the dowitchers so far from their southern homes, to a feast for them and their hatchlings. But food is not what the dowitchers have in mind now. They have done what they came here to do. Their babies, only a few days old, are already able to care for themselves. It is time for the parents to go. Without a backward look, the male spreads his wings, catches the wind, and flies. His mate watches him leave with no regrets, no memory even that will draw them back together again. There are plenty of dowitchers in the tundra for her to choose from next year. For now, she too feels the pull of migration, but she will catch another wind, another night. On Saturday, the male arrived at the Fill. The warm breeze ruffled his feathers as he bent his long bill into the rich mud of Main Pond. I found him there on the western shore, bobbing his head rapidly in and out of the water as he used his long, sensitive bill to hunt for larvae and crustaceans. He looked up at me when I slowly and carefully opened my camp stool and sat down to watch. The Mallards floating nearby scarcely bothered to turn their heads. They know people are no threat to them here, and somehow their peacefulness reassured the dowitcher. He studied me for a minute, then went back to stitching the mud. He had miles to go on his way south, but for now, there were critters to eat and safety among the ducks. If you’re a dowitcher on migration in July, that’s all you need. Life is good. This entry was posted in Uncategorized on July 14, 2010 by constancesidles.